On 7 May 2018 in Aden, Yemen, a boy is vaccinated against cholera. Following an “important increase” in the number of suspected cholera cases recently in Yemen, a new vaccination campaign is underway in coordination with the government to prevent a third major outbreak, said the World Health Organization (WHO) on Tuesday. About 540,000 women, children and men who received a first dose of the vaccine in August, in Hudaydah and Ibb governorates, are targeted in this new four-day campaign. More than 3,000 health workers have been trained and mobilized for this effort. During the latest campaign, close to 387,400 people were vaccinated, covering 72 per cent of those in need of inoculation. Yemen, considered today by the UN to be facing the world’s worst humanitarian crisis, has already suffered from the largest cholera outbreaks in recent history, against the backdrop of heavy civil conflict. According to WHO, since April 2017, there have been more than 1.2 million cases of suspected or confirmed cholera in Yemen, including over 154,500 cases in 2018 alone. More than 2,500 people are reported to have died from the preventable disease. Around 30 per cent of cases involve children under the age of five and all but one of the country’s 23 governorates have been affected. Conflict in Yemen – already one of the poorest countries in the world before the crisis – escalated in March 2015, when an international coalition led by Saudi Arabia intervened militarily at the request of the Yemeni presidency, against a widespread Houthi rebel insurgency. Airstrikes and ground-fighting have become a daily occurrence for millions of civilians. More than 16 million people lack access to basic healthcare and only half of the country’s health facilities are operational. 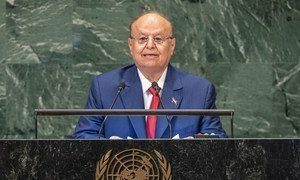 The Yemeni Government is striving to restore peace, security and stability and provide essential services to its people, while the country remains gripped by a war imposed by Iran- and Hizbullah-backed armed militias, Yemen’s President Abdrabuh Mansour Hadi Mansour told world leaders at the United Nations General Assembly on Wednesday. 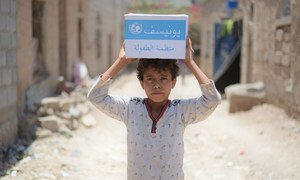 Despite continuing challenges in Yemen, the United Nations and partners have provided a robust humanitarian response to the world’s largest humanitarian crisis, thanks to major donor support. However, as the situation continues to worsen for civilians across the country, aid agencies warned on Monday that international aid efforts must be sustained to avoid a major catastrophe and called for a political end to the conflict.